Viva Vegan! 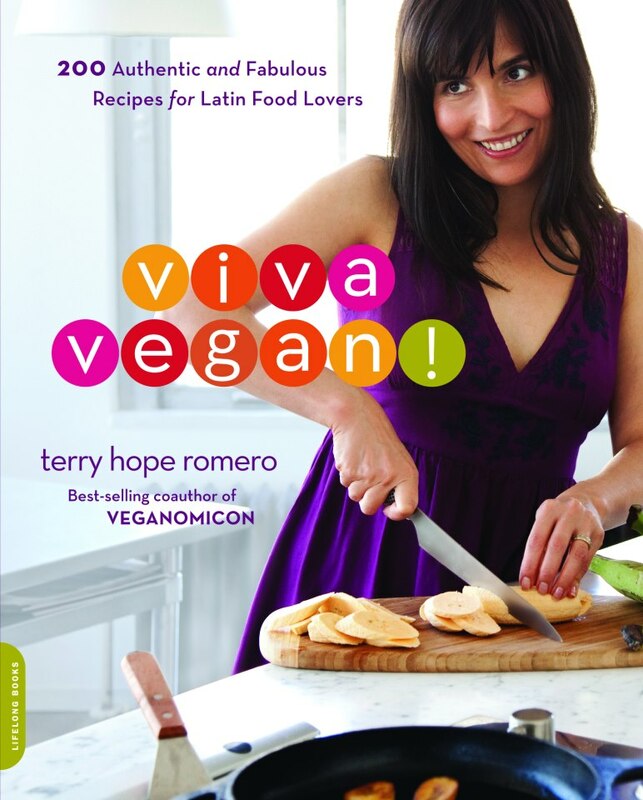 is Terry Hope Romero’s attempt to teach vegans that there’s more to Latin vegan cooking than swapping out the cheese on your enchiladas with Daiya. It does succeed at introducing a variety of yummy Latin foods that readers may not have experienced before, such as llapingachos, an Ecuadorean dish that combines potatoes and peanut sauce, and–a favorite in my house–arepas. Veganizing these dishes is a more difficult task in a cuisine that relies so heavily on meat for flavoring. Rather than just swapping out meat for seitan, Romero offers creative suggestions for fillings in empanadas and arepas, and yes, great preparation ideas for seitan. The dessert chapter is definitely the most valuable part of the book. I made a Cafe con Leche flan and didn’t have to spend a week experimenting with the amount of agar to use. For the savory dishes, I will probably keep Presilla’s Gran Cocina Latin by my side and veganize them myself. For the sweets, however, I’ll be glad to turn to Viva Vegan! every time and let Romero do the work for me. This entry was posted in Cookbooks, Reviews, VeganMofo and tagged arepas, avocado, Terry Hope Romero, vegan, veganmofo2013. Bookmark the permalink. I love the look of every recipe in this book — I think I need to cook from it for a week just to make so many of the recipes I want to try! I highly recommend the Tostones with Avocado and Palm Ceviche and the arepas!